Convection-permitting models (CPM) with at least 4 km horizontal grid spacing enable the cumulus parameterization to be switched off and thus simulate convective processes more realistically than coarse resolution models. This study investigates if a North American scale CPM can reproduce the observed warm season precipitation diurnal cycle on a climate scale. 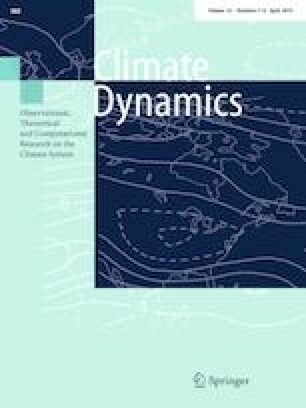 Potential changes in the precipitation diurnal cycle characteristics at the end of the twenty first century are also investigated using the pseudo global warming approach under a high-end anthropogenic emission scenario (RCP8.5). Simulations are performed with the Advanced Research Weather Research and Forecasting (ARW-WRF) model with 4-km horizontal grid spacing. Results from the WRF historical run (2001–2013) are evaluated against hourly precipitation from 2903 weather stations and a gridded hourly precipitation product in the U.S. The magnitude and timing of the diurnal cycle peak are realistically simulated in most of the U.S. and southern Canada. The model also captures the transition from afternoon precipitation peaks eastward of the Rocky Mountains to night peaks in the central U.S., which is related to propagating mesoscale convective systems. However, the historical climate simulation does not capture the observed early morning peaks in the central U.S. and overestimates the magnitude of the diurnal precipitation peak in the southeast region. In the simulation of the future climate, both the precipitation amount of the diurnal cycle and precipitation intensity increase throughout the domain, along with an increase in precipitation frequency in the northern region of the domain in May. These increases indicate a clear intensification of the hydrologic cycle during the warm season with potential impacts on future water resources, agriculture, and flooding. The online version of this article ( https://doi.org/10.1007/s00382-019-04754-9) contains supplementary material, which is available to authorized users. We gratefully acknowledge the Natural Sciences and Engineering Research Council of Canada (NSERC) for funding the Changing Cold Regions Network (CCRN) through their Climate Change and Atmospheric Research (CCAR) Initiative, as well as the Global Water Future (GWF) project and Global Institute of Water Security (GIWS) at University of Saskatchewan. L. Scaff acknowledges the support from CONICYT-Becas Chile scholarship program. L. Scaff appreciates S. Krogh for providing valuable comments to improve this study. Y. Li acknowledges the support from the NSERC Discovery Grant. A. Prein, C. Liu, R. Rasmussen, and K. Ikeda appreciate the support from the Water System Program at the National Center for Atmospheric Research (NCAR). The National Science Foundation sponsors NCAR. This project was performed at the NCAR facilities funded through NSF-Water System Program. We would like to acknowledge high-performance computing support from Yellowstone (ark:/85065/d7wd3xhc) provided by NCAR’s Computational and Information System Laboratory, sponsored by the National Science Foundation.